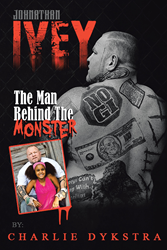 “Johnathan Ivey: The Man behind the Monster” from Christian Faith Publishing author Charlie Dykstra is an incisive biography of Johnathan “Big John” Ivey, known in the MMA world as the Leg Lock Monster, a brawling monster of a man who grew up fighting poverty, turmoil, prejudice, and dysfunction, who then takes his fight into the ring to provide for his young daughter as a single dad, a decision that transforms this monster into a loving Christian father who overcomes all obstacles and shocks the world. “Johnathan Ivey: The Man behind the Monster”: a searing memoir chronicling the life of an MMA legend turned Christian dad. “Johnathan Ivey” is the creation of published author, Charlie Dykstra, a minister, Christian counselor, radio talk show host, and MMA enthusiast. Dykstra shares, “No one could ever guess what the Leg Lock Monster is really like by his appearance. It would take a book about him to help people to understand who he is. So I am writing one. My task is to explain the single most complex, intriguing, and surprisingly honorable person I have ever known. After years of bonding with the monster, he asked me to do his biography. Writing the life story of Johnathan Ivey is a complicated thing. The first thing that came to my mind was where even to begin? My first effort is to just break the ice on it all, and then I will tell from the very beginning how an underprivileged child became a legendary fighter and father in a category all his own. Published by Christian Faith Publishing, Charlie Dykstra’s new book is a beautiful living portrait of self-sacrifice in the name of love. Dykstra masterfully shows the overlap between the brutal world of professional fighting and Christianity in an authentic way in the face of dissenters. View a synopsis of “Johnathan Ivey: The Man behind the Monster” on YouTube. Consumers can purchase “Johnathan Ivey: The Man behind the Monster” at traditional brick & mortar bookstores, or online at Amazon.com, Apple iTunes store, or Barnes and Noble. For additional information or inquiries about “Johnathan Ivey: The Man behind the Monster”, contact the Christian Faith Publishing media department at 866-554-0919.